Evolution works with what's at hand. So if you start with a normal bird skull – bill pointing forward, eyes oriented front or sideways, ears behind eyes – and introduce the challenge of seeing behind your head while your bill is pushed deeply into the soil, what do you get? The American Woodcock! With its long bill constantly probing the soil for earthworms, its entire skull has been rearranged. Relative to other birds, woodcocks' eyes have moved toward the top and rear of the skull, pushing the ear openings downward. Apparently the brain followed suit! 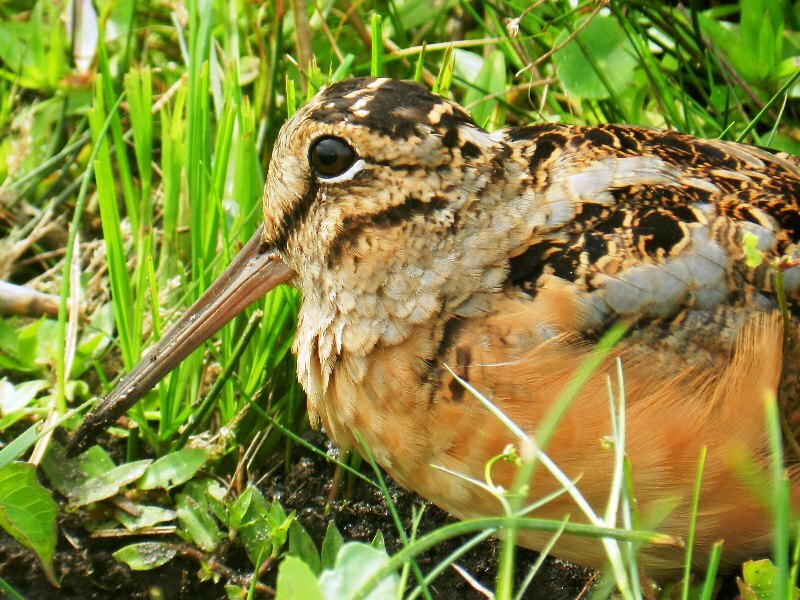 A woodcock’s eyes are large, and set high and far back on its head – so situated that it likely has panoramic vision both above and behind, to detect potential predators. And it needs to be watchful, because it spends much of the time with its long bill poked into the soil, in search of earthworms. The woodcock likely can’t see the tip of its bill, but it doesn’t really need to. The bill tip is fully loaded with diverse sensory receptors. As evolution pushed the woodcock’s large eyes farther back in the skull, something had to give anatomically. So a woodcock’s ear openings are now set under the eyes, instead of behind, as in most birds. And its cerebellum, the part of the brain that handles muscular control, is no longer where it is in most birds - at the rear of the skull. It's ended up under the rest of the brain, just above the spinal column. Adaptation to its environment has, essentially, turned the woodcock’s brain upside down. Bird sounds provided by The Macaulay Library of Natural Sounds at the Cornell Lab of Ornithology, Ithaca, New York. American Woodcock  recorded by W L Hershberger. 'Scotch Strathspey and Reel' by Percy Grainger performed by John Eliot Gardiner & Monteverdi Choir, Universal International Music.